WASHINGTON, DC, June 30, 2011 (ENS) – The U.S. Fish and Wildlife Service today released the final recovery plan for the threatened northern spotted owl, which relies on old-growth Pacific Northwest forests to survive. The plan’s goal of conserving spotted owl sites and high-value spotted owl habitat means some of the lands previously slated for potential timber harvest on federal lands, and possibly non-federal lands, will not be logged, federal officials said today. The plan’s three main priorities for achieving spotted owl recovery are: protecting the best of its remaining habitat, actively managing forests to improve forest health, and reducing competition from barred owls. 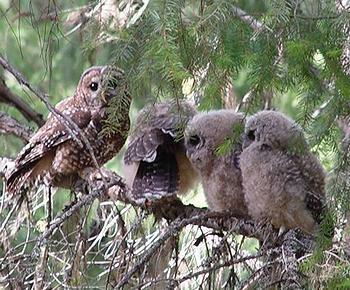 Barred owls, native to eastern North America, have moved into the spotted owl’s range in Washington, Oregon, and northern California. “For more than 20 years, northern spotted owl recovery has been a focal point of broader forest conservation efforts in the Pacific Northwest,” said Robyn Thorson, the U.S. Fish and Wildlife Service’s Pacific Northwest regional director. “This revised recovery plan is based on sound science and affirms that the best things we can do to help the spotted owl turn the corner are conserving its habitat, managing the barred owl, and restoring vitality to our forests,” Thorson said. Because 20 million acres of U.S. Forest Service lands and two million acres of Bureau of Land Management lands could be affected by the recovery plan, these two agencies worked with the Fish and Wildlife Service on key forest management recommendations and provided formal letters of support for the plan’s recovery goals. Active management of forests for owl conservation involves an “ecological forestry” approach that will restore ecosystem functioning and resiliency, the officials said. This may include fuels treatment to reduce the threat of severe fires, thinning, and restoration to enhance habitat and return the natural dynamics of a healthy forest landscape. Most of the recovery actions the U.S. Fish and Wildlife Service has carried out since finalizing the spotted owl’s 2008 recovery plan deal with the barred owl threat. The Service has developed a proposal for experimental removal of barred owls in certain areas to see what effect that would have on spotted owls, and then to evaluate whether or not broad scale removal should be considered. “While the new recovery plan has been refined and improved from the 2008 version, the U.S. Fish and Wildlife Service continues to implement the most important recommendations,” said Acting U.S. Fish and Wildlife Service Director Rowan Gould. The northern spotted owl was listed under the Endangered Species Act in 1990. The subspecies is now thought to number fewer than 4,000 pairs, and is declining at a rate of 2.9 percent per year, says Steve Holmer, senior policy advisor at the nonprofit American Bird Conservancy.